Jim Russell was a horticultural grandee. After a false start caused by the outbreak of the Second World War, he took over a distinguished but ailing nursery, revived its fortunes and began a prolific career in garden design that lasted for half a century. Russell was, essentially, a plantsman. His personal enthusiasms were for the larger shrubs, especially rhododendrons and the old shrub roses, in which his Sunningdale Nursery, in Surrey, specialised, and woodland-garden favourites such as magnolias, viburnums, hydrangeas and tree peonies. 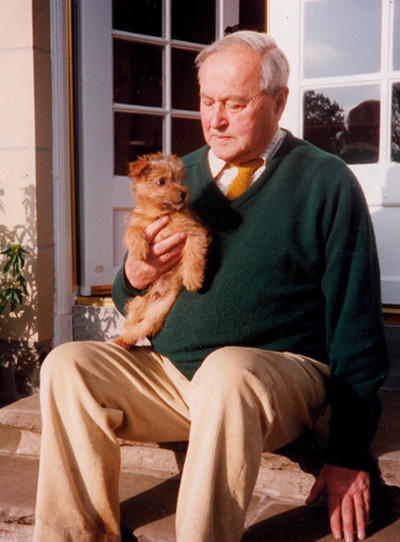 His plant knowledge was dauntingly prodigious, ever growing through plant-hunting expeditions across the world (Mexico, Japan, Madagascar) and ideally discussed in civilised surroundings with like-minded enthusiasts such as John Bond of the Savill Garden at Windsor, or fellow nurseryman Sir Harold Hillier. Beyond this garden aristocracy, Russell was a private man who had no interest in the trappings of fame. He would wave away invitations to splendid receptions because he was bored by the prospect of small talk that didn’t revolve around gardens. So it is that although Russell is celebrated among those who received his advice or moved within his magic circle, his name is barely known to a wider public. Russell’s nursery had been founded as Standish and Noble in 1847, when it played a key role in the development of the new hardy hybrid rhododendrons from the flood of species arriving from the Himalayas. When Russell took it over in the 1940s, he adapted this tradition to form a successful enterprise selling plants to garden owners who relied on his considerable reputation for good plants and advice. Russell was an Old Etonian, and many of his clients came via that network. His business practice would seem odd today, and it certainly unnerved many clients. A planting layout would be drawn up, typically a framework of borders stuffed with his favourites and punctuated with statues, as at Seaton Delaval, in Northumberland. The plants would arrive in beautiful condition, together with a bill covering design, lifting, packing and delivery, with an option for Russell’s presence on site for setting out. As no costs had been mentioned when the order was placed, some clients protested indignantly. Russell distanced himself from the row by appointing Graham Stuart Thomas as his nursery manager to extract payment. As the private-garden market began to dry up in the 1960s, Russell was engaged to advise on planting at a number of large-scale corporate projects. His triumph at the Wiggins Teape headquarters, in Hampshire, known to this day as the Hanging Gardens of Basingstoke, was followed by a series of monster commissions for factory and office-block settings. The income from these projects enabled Russell to set off in search of plants across the world. The glory of his later years was the Castle Howard estate, in Yorkshire, owned by another Eton chum. Russell used the contents of his nursery as the basis for his epic projects, which resulted in the Rose Garden in the former kitchen garden, the Woodland Garden in Ray Wood and the huge Arboretum. These great features are his considerable legacy. 1920s-1940s James Philip Cuming Russell was born in 1920 into a military family. At Eton, where he made contacts that would form the basis of his future career, he won a prize for flower drawing. In 1939, on the point of entering Cambridge University, he was called up, serving in the Hertfordshire Yeomanry until he was invalided out in 1942. 1950s Russell combined running his revitalised Sunningdale Nurseries (specialising in rhododendrons, right) with a highly successful garden- design business. He followed up an early success at Seaton Delaval (1950), now acquired by the National Trust, with projects at Glenveagh in Co Donegal, Ireland (1953), and the replanting of Lutyens’ and Jekyll’s Folly Farm (1955). In 1956, Graham Stuart Thomas joined the business as nursery manager. 1960s Although business continued to boom, Russell sold the nursery in 1968 and moved to the Castle Howard estate, where he effectively took the entire nursery stock and began to form it into a series of magnificent ornamental gardens. his trademark hostas, lavender hedges, pergolas and arbour seats. Ray Wood was filled with flourishing rarities as a woodland garden, big specimens of Fitzroya cupressoides and many species of eucalyptus looming over great drifts of terrestrial orchids on an apparently unpromising north-facing slope. The new arboretum, of incredible extent, was mainly planted as tiny specimens in the confident (and justified) expectation that they would thrive better than larger trees planted as standards. Although the private garden work continued-a roof garden for Sir Charles Clore in Monte Carlo as well as other gardens along the Riviera-Russell unexpectedly branched out into big new landscaping projects, often in association with the civil engineer Arup. Giant new factories and office blocks in Basingstoke, Colchester and Portsmouth were festooned in trees and shrubs, and Russell even planted the monkey jungle and butterfly house at Blackpool Tower. This was diversification on many levels. 1980s The Castle Howard project continued to demand Russell’s full attention, but his increasing world travels (China, Sri Lanka, West Indies), largely devoted to plant-hunting expeditions (right), also brought him a major landscaping project in Japan for the RHS. that he had continued to thrive in changing times. Towards the end of his career, the RHS honoured him with its two senior awards, the Veitch Memorial Medal and the Victoria Medal of Honour. This was the only recognition this eminence grise valued: the richly earned admiration of his peers.